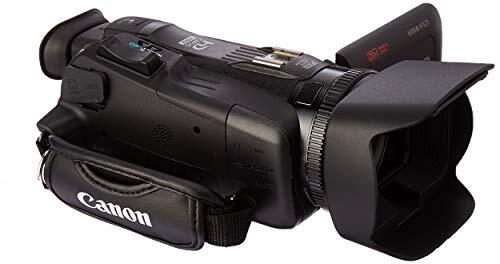 The best HD camcorders under 1000 dollars list are based on expert review ratings, Amazon ratings and price in the range of $700 – $1000. These video cameras have very good features like the big screen, 3CCD sensor, low- light performance. 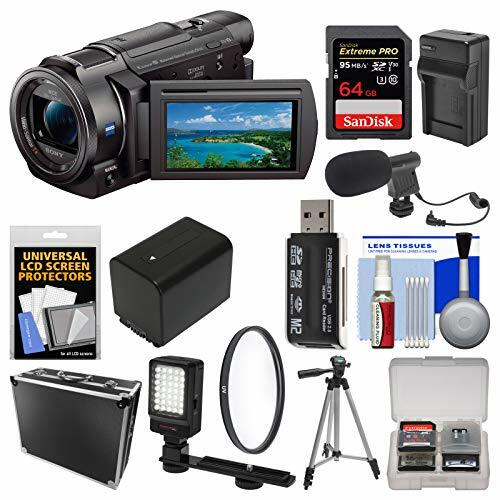 These camcorders are great for beginner level video makers. Under $1000, you can get moderate camcorders with upgraded hardware and updated features that are in sync with the ongoing market. As the list shows, you do have top camcorder brands in this price bracket that are at least High-definition and are great for outdoor usage. Starting with the 4K ones listed here, the Sony FDR-AX53 and Sony FDR-AX33 have the ultimate 4K recording capability. The AX53 by Sony records in XAVC-S format at 16.6MP assisted by Exmor R sensor. Though you also have multiple formats like AVCHD and MP4. B.O.SS Stabilization compensates for shaky recordings and gives out a decent stable output. 20x Optical Zoom is one of the specialties of this camcorder which has been fitted with ZEISS Lens of 26.8mm. To get even closer to the target, the 40x Clear Image zoom makes it possible to record details without blur. To monitor your work, keep an eye on its 3-inch sharp viewfinder panel with touch support. The AX-33 model listed here comes with a bundle that includes 64GB SDXC card, 8-inch table tripod, carrying case, cleaning and care kit, Focus lens cleaning pen, LCD screen protectors and Wasabi Power Battery. This camcorder, unlike the AX53, has Direct Pixel Readout for better processing of your media content and ultimately, the better output. Optical Zoom of 10x is what this camcorder facilitates for close-up shots. The codecs used in both the camcorders are the same and the video output resolution as well as 4K for AX-33. Comparatively on the better end, the Sony HDR-CX330 comes with a green camera world kit which, other than the camcorder itself, includes two rechargeable Li-ion batteries, External charger, 16GB and 32GB Class 10 memory cards, Full-size tripod, HDMI to micro HDMI cable, Carrying case, universal card reader, Lens cap keeper and camera cleaning kit. This one, though with a superior quality, records Full HD videos at 60FPS which is smooth as butter. And producing 9.2MP still images, this is, without doubt, a great still camera as well. Capture everything on the sides and beyond with the Wide-angle Sony G Zoom lens which facilitates an insane 30x Optical zoom and 60x Clear Image zoom. SteadyShot Image Stabilization and 7 picture and video effects are the assistive tools that Sony has included to ease up things a bit for you. Transfer methods include NFC and WiFi. 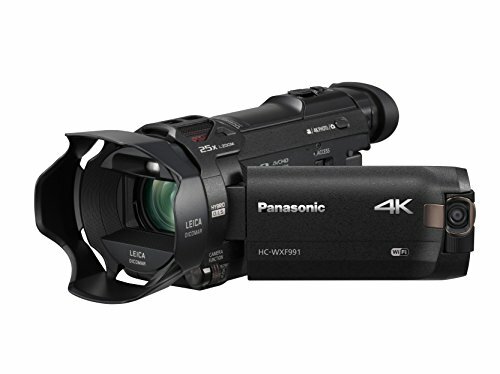 The only one on the list which is HD as well as 3D-ready is the Panasonic HC-X920-K which is basically an Ultrafine camcorder producing Full HD videos. And the 3 x BSI MOS sensors make it possible for this cam to record 1080p videos at 60FPS with 5.1 Surround Sound. For a better zoomed-in view, 25x Intelligent Optical Zoom does just the job you need. Or if Canon suits you more, check out the Canon Vixia HF G20 which captures 1080p videos via Genuine Canon 10x HD lens working with 2.37MP HD CMOS Pro Sensor. Dynamic stabilization keeps the frame in place and Professional Shooting assist functions help you shoot in the most apt way possible. 3.5” Widescreen touch panel enables you to control everything with the power of touch. 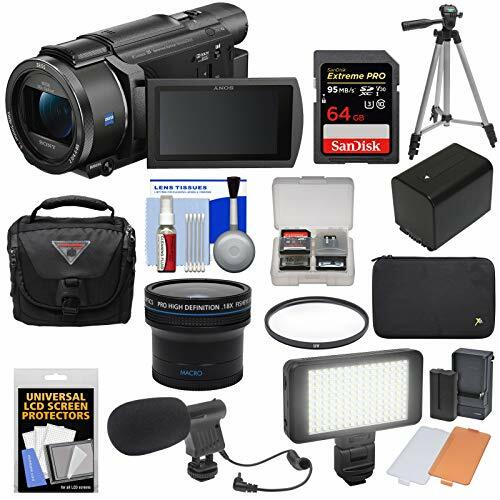 And the best part is that this deal includes the complete pro kit for professional purpose with 128GB HDSC, LED Night Light, Tripod, Monopod, Action stabilizer, Handgrip, Microphone and more.